Moonstone is the most valuable stone from the feldspar group. A billowy or floating blue light becomes visible when the stone is rotated in front of a light source. This effect, called adularescence, is caused by the intergrowth of another feldspar in oriented positions within the main mass of the moonstone. In many areas of the world, moonstone is believed to bring good fortune to its wearer. In ancient times, it was supposed to arouse tender passions in lovers and give them the power to read the future; to be effective as a means of determining one’s personal future, it had to be placed in the mouth when the moon was full. 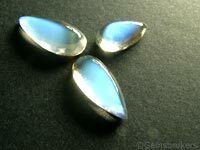 Moonstone can occur in a variety of colors aside white, like yellow, gray, pink or green, but for these « fancy » colored moonstones, the effect produce a white eye and not a blue sheen. Moonstone is the birthstone for June, alternating with alexandrite and pearl.